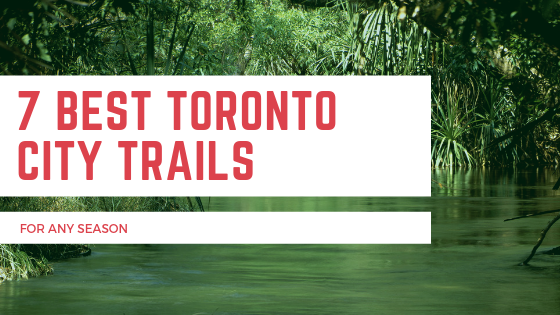 No matter the season, check out these fun Toronto City Trails that are great for a refreshing walk or a nice run in nature in the city. 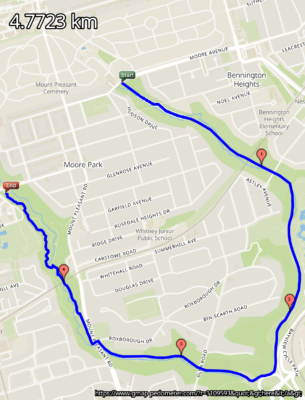 Running from Mount Pleasant Road, just north of Mount Pleasant Cemetery to Allen Road, south of Elm Ridge Drive. The trail is mostly flat and easy to navigate. To make your walk longer consider walking through the beautifully kept and serene Cemetery. 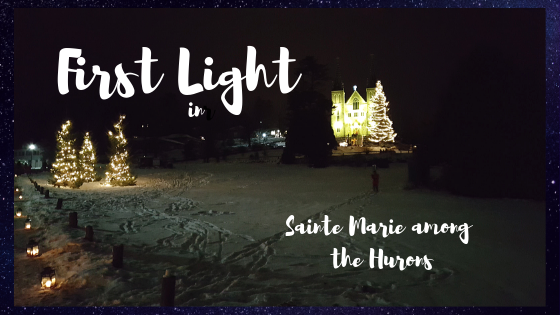 Another way to lengthen your walk, pass through the cemetery and head over to Moore Park Ravine and walk towards the Brickworks. There are no specific parking lots that cater to this trail and on weekends, it may be busy. Usually though space can be found in side streets off the Belt line. There are no public washrooms along this route. More northerly, the Blythwood Trail can be entered from Mount Pleasant and Blythwood Road. It travels east through Sherwood Park and comes out at Bayview Avenue. Cross the road here to enter the trail to the Sunnybrook Stables. The Blythwood section is paved and quite an easy walk. The section in Sherwood Park is mainly a dirt and wood chip trail. Stairs have been put in to navigate some steep inclines on this short trail and straddle the more treacherous parts. The Sunnybrook part of this trail, apart from the steep decline into the Sunnybrook Ravine, is a flat dirt track until you’re close to Sunnybrook Stables where it becomes paved again. As with the Belt Line, there aren’t any specific parking lots available. If you start the trail from Sunnybrook however, there are 2 options. Either park in the small parking lot at the bottom of Raab Boulevard which cuts through Sunnybrook hospital grounds. Or park in one of the Wilket Creek Park parking lots to be entered from Leslie Street. There are washrooms in Wilket Creek Park located at the start of Wilket Creek Trail. The Wilket Creek Trail is an easy and paved short trail leading from Wilket Creek park to Edwards Gardens. The Toronto Botanical Garden is also located here. There is an incline to get here from the path but the gardens are well worth it. They’re the property of a non-profit organization that maintains the beautifully manicured gardens flowerbeds and walkways. There are cute small paths that take you over wooden bridges, past fountains and a pond. This is the perfect walk for a lovely sunny day. Park at either end at Edward Gardens on the corner of Lawrence and Leslie, or in Wilket Creek park, off of Leslies Street. There are washrooms at either end too. Walk E.T. Seton Road towards Sunnybrook Stables but take the bridge to the left, to the small parking lot at the bottom of Raab Boulevard. From here, keep right for the Glendon Forest trail up north towards Lawrence Avenue. Walking up and back adds is 5.5km. Again starting from Wilket Creek Park, park and then take E.T. Seton Road south underneath Eglinton Avenue to the parking lot and enter the Don Trail. The trail is easy and paved. Ideal for an easy stroll on a weekend afternoon while you pass by an archery field (safely tucked away but fun to watch for a while) and a Frisbee golf course. Parking and washrooms in Wilket Creek Park. Great walk when bringing a stroller. 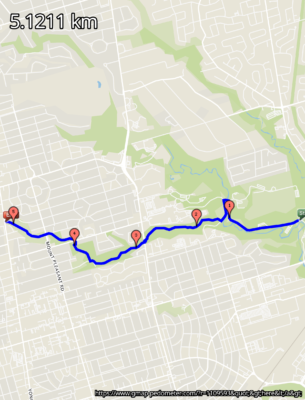 This trail starts just off of Don Mills and like the Don Trail is paved and flat. There are a few inclines but overall the path is easy to travel. Because of it’s length it also lends itself to cycling or roller-blading. 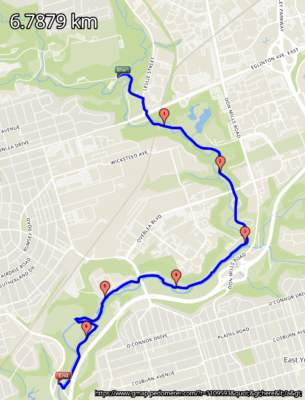 One end of the trail starts from Don Mills Road but you can also get on from Pottery Road, where you can park the car . The parking area isn’t big, more of a cleared away section but it will allow for easier access to the trail, especially when bringing roller blades or a bike. Another option is to park at the Brickworks, cross the road at the traffic light and make your way long Pottery Road to the trail just over the railway bridge on the right hand side. This trail can take you all the way to Cork town just east of the Distillery District or Cherry Street itself. At the Distillery District you’ll find ample opportunity for drinks, restaurants or some interesting shopping. Washrooms and parking at the Brickworks or the Distillery District . Additional parking along Pottery Road. 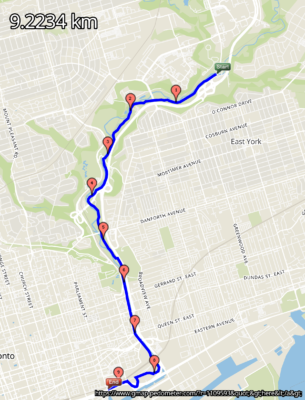 This ravine trail alongside Mud Creek takes you from Moore Avenue to the Evergreen Brickworks. 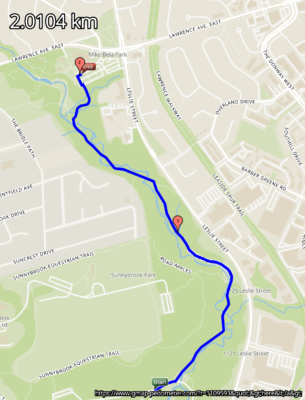 It then loops around to Park Drive Reservation trail which flanks Yellow Creek and leads back up to Mount Pleasant Road. When you cross the road and keep following this trail, it will end up back at the Yonge Street side of Mount Pleasant Cemetery. This trail is often regarded to be part of the Belt Line. It’s a dirt or wood chip path with a few steeper in/declines. Other than at the Brickworks, there are no parking lots or public washrooms. 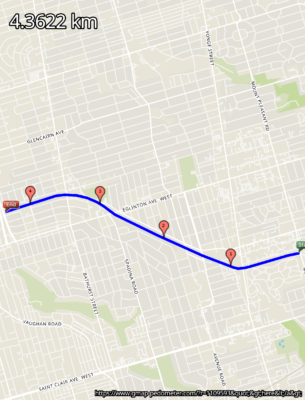 Want a flat, easy to navigate and mainly paved trail with great views of Toronto? This may just be it. It’s a straight forward back and forth path, passing which you can extend to take in the wetland habitats that are being created to the east portion; droves of swans, salamanders, migrating birds, coyotes and a beaver. Make sure to walk all the way over ad around the lighthouse at the very end of the path. 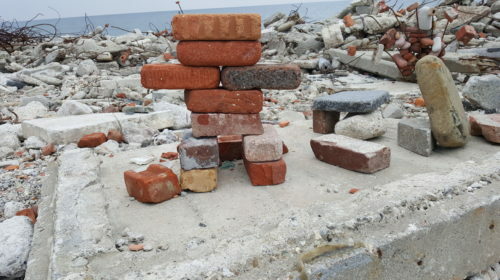 Some spontaneous art using dumped construction materials, has been created by other visitors. There are no public washrooms on this trail but there is a portable toilet at the parking lot. The park trail starts from the parking lot where Leslie Street and Unwin Avenue meet. 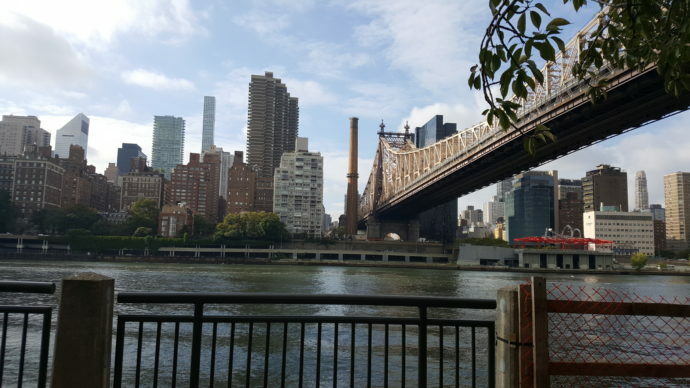 The park is open on weekdays from 4 pm – 9 pm and weekends and holidays from 5.30 am – 9 pm.